Shallow-Water House MOC. Front slightly from above. 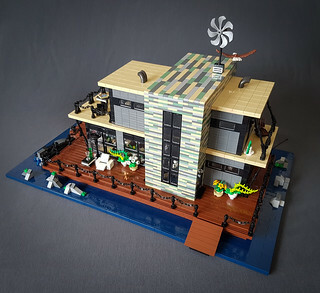 A floating home by the sea. Modern and comfortable. The house is surrounded by a wooden deck and shallow water. A bridge connects the deck to the guay. Fully interiored as always. Kitchen, toilet and living room downstairs. Bathroom, bedroom and storage space upstairs. You find photos of the interiors in my photostream. Inspiration comes from childhood summers and sailing with my parents. It was a challenge to catch the maritime feeling with details such as railings and stays and at the same time keep the design clean and modern. I used dark blue bricks to create the water surface. The more common technique with transparent tiles or plates wasn't really on option because it didn't fit in the colour scheme.